“The plight of the Mumbai bar girls due to the closure of dance bars lead to a hype created by all front line media and publications that the issue made it to the front pages of all leading dailies. Why not even a mention of the plight of the residents of Ulhasnagar?” was the rhetorical question posed by Shri Sital Harchandani, former mayor, to the SINDHISHAAN team on a fact finding mission to Ulhasnagar. Admittedly, the loss of income of the 15000 odd bar girls, some of whom being the sole bread earners in the family, would have a devastating impact on the financial stability of the household. However, it is pertinent to note that alternate job opportunities exist, albeit not as lucrative, which could be availed of to maintain the semblance of basic sustenance. On the other hand the 30,000 odd effected families, adding upto almost 150,000 residents, majority of them Sindhis have the Sword of Damocles hanging over their heads on account of the order passed by the Bombay High Court to demolish unauthorized and illegal dwellings. Rendered homeless due to partition, a part of the community was granted shelter as refugees in Ulhasnagar. The trauma is being revisited after 58 years with the imminent threat of becoming Homeless once again. We seem to have come a full circle back to square one. 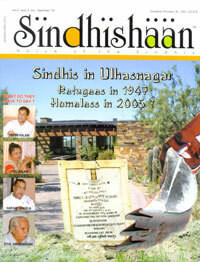 A report on the current status is featured in this issue as a lead story. The idea is to create awareness amongst the members of the community, spread all over, about the tragedy staring in the face of our brethren in Ulhasnagar, and to appeal to our stalwarts to come forward to express their solidarity with the residents of Ulhasnagar and ensure all avenues are explored to evolve a reasonable, just and permanent solution and see that JUSTICE PREVAILS.